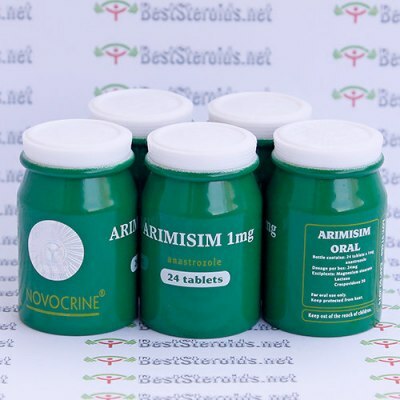 Arimisim (anastrozole) is the aromatase inhibitor of choice. The drug is appropriately used when using substantial amounts of aromatizing steroids, or when one is prone to gynecomastia and using moderate amounts of such steroids. It works by decreasing estrogen levels in the body. As an aromatase inhibitor, Arimisim's mechanism of action - blocking conversion of aromatizable steroids to estrogen - is in contrast to the mechanism of action of anti-estrogens such as clomiphene or tamoxifen, which block estrogen receptors in some tissues, and activate estrogen receptors in others. With moderate doses of testosterone 0.5 up to 1 mg/day is usually sufficient. If a dose is skipped, take as soon as possible, or if it's close to the next dose, skip and take the next dose. Do not double the dose. Using Arimisim, additionally the quality of the muscle should be greater, the athlete appearing harder and much more defined without holding excess water. A daily dose of one tablet (1 mg) can produce estrogen suppression greater than 80-85%. Effective way to block estrogen build up. I took 1mg every other day and after a week gyno was gone. I kept this protocol all the way through my PCT and it never came up again. It works perfectly at .5 eod. Dosage is spot on. When I varied my intake to fit my needs I actually NOTICED a difference. Adex is a nice fit: strong enough for results yet not as harsh as some others. WAY less bloating and acne was basically non existent.